Other travelers will be envious of you! Stay cool, calm, and comfortable on your next trip with the Pür Voyage Memory Foam Hypoallergenic Travel Pillow with the Stay Cool Removable Bamboo Cover. The memory foam in this product will mold to your body's natural contours and help you sleep by maintaining your proper head and neck alignment. Its the Ultimate Comfort Experience. It is easy and soft to squeeze, yet it will return to its original shape. Therefore, when you use it, it will quickly conform to the specific characteristics of your neck, head, and shoulders, providing the perfect amount of support to help relieve tension and then it will maintain its shape. Also, the pillow cover is Made of Bamboo Fiber which is removable and washable so that it may be cleaned when needed. Don't leave home without it, whether you're in a vehicle, train, or an airplane this product will suit your traveling needs! Give this remarkable pillow a try you will not be disappointed! Bamboo is softer than cotton, It is also antibacterial, hypoallergenic, breathable & helps regulate temperature. 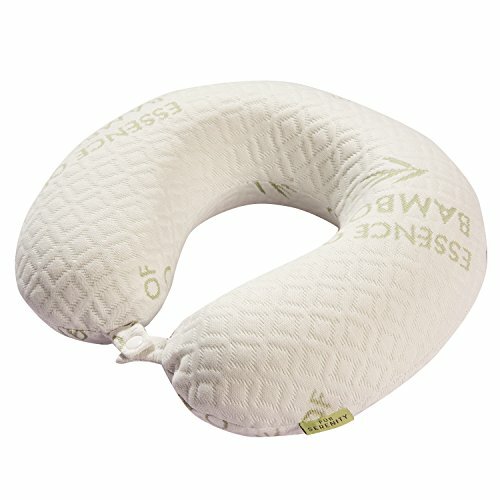 Go Green & Get Yourself a Eco Friendly Travel Neck Pillow Today! If you have any questions about this product by Lux Voyage, contact us by completing and submitting the form below. If you are looking for a specif part number, please include it with your message.